G.Loomis Cross Specialized Fly Rod is designed to cast big flies as far as you can imagine. 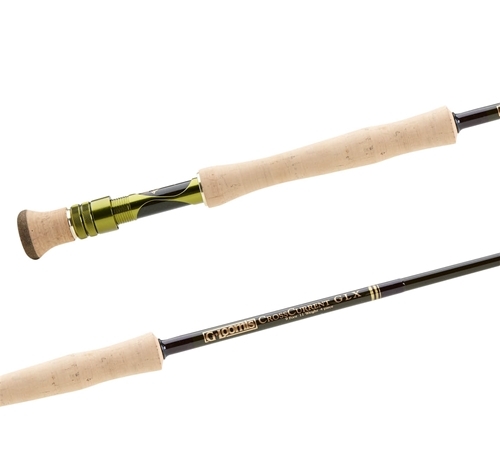 The G.Loomis Cross Specialized Fly Rod will handle large streamers, up to 5 inches, and functions best utilizing heads of 35 to 40-feet, in the 400-450 grain range, including saltwater, striper and shooting tapers.When it comes to saltwater fly fishing, anglers face many challenges. Whether it's billfish or tuna in the blue water or big stripers from the beach, we make the rod. It's not a matter of finesse for the pelagics. You don't need to make long casts or cover a lot of water. You troll teasers to get the fish excited and up close, then you make the cast. Imagine a big striped marlin, all lit up, trying to find the teaser you just drug across his nose. The only thing he sees is a big streamer, looking a lot like the baitfish he just tried to eat... he grabs it, and it's a battle you'll never forget! Don't forget to pull as hard as you can. The deck-hand WILL yell at you. He's not the one with numb forearms and aching wrists. Landing monsters like this on the fly is a lot of work, but is extremely rewarding! Now if you can just manage to stay on your feet for the photo. Did we mention they pull hard too? Now... let's move to the beach. Suppose you're watching a mob scene in the surf with big stripers and blues blitzing just out of range. No matter how hard you try, you just can't seem to get that fly far enough out there to hook up. Maybe it's the wind - it's almost always breezy on the beach. It might be that big fly is a little too much for your single-hand rod or it might be the waves. What do you do? Grab one of our Cross Current Beach rods and get amongst 'em. They give you incredible casting range and when you hook a big striper, you'll be amazed how fast you can get him on the sand. This is power personified, plus it's a heck of a lot of fun. We know it's a lot to ask of a fly rod, but it's what we do. We make light, tough, cast far in the wind, power fly rods. It's simple really! They need to get your fly to the fish, fight him fairly (or not) and come back in the same number of pieces you started with. Game on!! This is the lightest of our two-handed "beach rods", designed to cast big flies as far as you can imagine. Whether it's the sand, the rocks or wading in the surf, a two hand rod will help increase your casting distance. It will handle large streamers, up to 5 inches, and functions best utilizing heads of 35 to 40-feet, in the 400-450 grain range, including saltwater, striper and shooting tapers. We dual rate the rods - both in the standard line sizes as well as grains to give anglers a better perspective of the power rating for their specific needs. Built with plenty of power to handle big stripers, bluefish and drum.